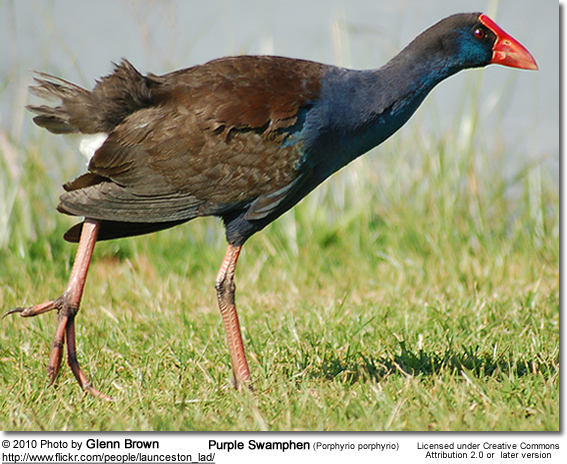 The African Purple Swamphens (Porphyrio p. madagascariensis) - previously known as African Purple Gallinules - are native to Egypt, sub-Saharan Africa and Madagascar. 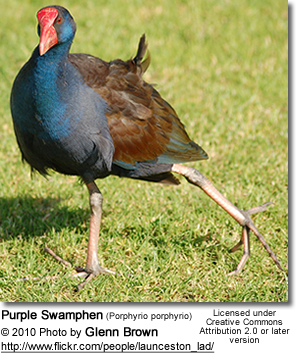 They are associated with wet areas with high rainfall, swamps, lake edges and damp pastures. They typically occur in pairs or larger communities. In urban areas, these birds have shown to quickly grow confiding. Within their range, this species varies from being common to being uncommon. They feed on tender shoots, plant material, as well as animal food, such as eggs, ducklings, small fish and invertebrates, including snails. Breeding activities often correlate with the peak rainfall, when food is more readily available. They nest in warm reed beds. To initiate breeding, the males perform elaborate courtship displays, which involve holding water weeds (nesting material) in their bills and bowing to the females while making loud chuckling vocalizations. Poplations found in the western parts of their range appear to be mostly monogamous; while those found in the eastern parts typically breed in cooperative breeding groups with may consists of several females and males sharing a nest or nest helpers (typically previous offspring) helping the breeding pair raise the young. 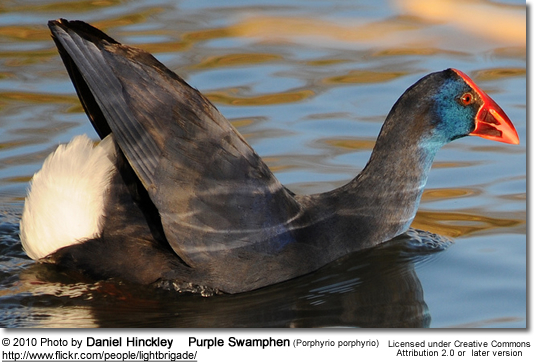 They nest in large pads of interwoven reed flags, on masses of floating debris, amongst matted reeds or in swamps. The nests are typically situated slightly above water level. A female lays between 3 - 6 speckled eggs that range in color from yellow-stone to reddish-buff. Communal nests may contain up to 12 eggs. Males and females (breeding pairs and helpers) share the incubation of the eggs, which lasts about 23 - 27 days to hatching. The hatchlings are covered with black downy feathers. The chicks are fed by parents and nest helpers for 10 - 14 days at which point most are independent. Calls: loud, high-pitched screeches or subdued musical tuk-tuk"